Eighty-five-year-old Addie tells the story of her life to her twenty-two-year-old granddaughter, who has asked her "How did you get to be the woman you are today." She begins in 1915, the year she found her voice and made friends who would help shape the course of her life. From the one-room tenement apartment she shared with her parents and two sisters, to the library group for girls she joins at a neighborhood settlement house, to her first, disastrous love affair, Addie recalls her adventures with compassion for the naïve girl she was and a wicked sense of humor. 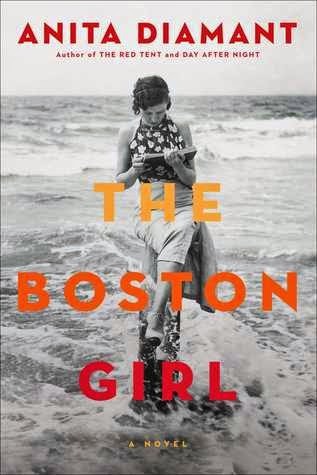 Written with the same attention to historical detail and emotional resonance that made Anita Diamant's previous novels bestsellers, The Boston Girl is a moving portrait of one woman’s complicated life in twentieth century America, and a fascinating look at a generation of women finding their places in a changing world. The only other book by Anita Diamant I've read is The Red Tent, which is one of my favorite novels. Because of that, I was a little surprised at this one as it is so completely different. The Red Tent is lush and evocative. The Boston Girl is a Jewish Grandmother recounting her life. And it is absolutely delightful! I think this book hit me on two emotional levels. For one thing, Addie Baum reminds me of my grandmother. Sort of. On the surface, there probably isn't that much in common between Addie, a Jewish girl growing up in the North End of Boston, and my grandmother, a Norwegian girl growing up in small town North Dakota, other than they are about the same age. But, Addie reminded me of what I always pictured my grandmother to be as a young woman--spunky and ahead of her time. The other tie for me was that this book takes place in Boston and I lived there for 3 years. While I don't miss the city, it is fun to read about place with which I'm familiar. Diamant vividly creates early 20th century Boston and it was great fun for me to take a trip back in time with her. This book reads exactly like what it is: a grandmother telling her granddaughter about her life and what shaped her into the woman she became. There are several times in the book where Addie makes asides, telling her granddaughter not to tell her mother something or, well, hinting about things that happened in her life that probably wouldn't be proper to talk about (her granddaughter, as you discover at the end of the book, gave up the hinting and just lays at all out--I almost snorted tea through my nose when that little bit came up!). This was one of those books that I just could not put down--I plowed through it in a little over a day, which is pretty fast for this mother of young kids. Yet, I still kept scratching my head about how this was so different from Diamant's The Red Tent. I guess it is the measure of a skilled author to be able to write in such different voices.